Definition at line 1542 of file wingdi.h. Definition at line 1573 of file wingdi.h. Referenced by CreateDisplayModeList(), GetAdapterMode(), GetColorDescription(), GetSystemColorDepth(), Main_DirectDraw_EnumDisplayModes(), Main_DirectDraw_EnumDisplayModes4(), Main_DirectDraw_SetDisplayMode2(), mEnumDisplaySettingsA(), Notify(), post_8bit(), post_8bit_no(), START_TEST(), test_ChangeDisplaySettingsEx(), and test_WM_DISPLAYCHANGE(). Definition at line 1570 of file wingdi.h. Definition at line 1566 of file wingdi.h. Definition at line 1556 of file wingdi.h. Definition at line 1557 of file wingdi.h. Referenced by pagesetup_set_defaultsource(), PRINTDLG_SetUpPaperComboBoxA(), and PRINTDLG_WMCommandA(). Definition at line 1543 of file wingdi.h. Referenced by convert_to_devmodeA(), GdiConvertToDevmodeW(), IsValidDevmodeA(), PRINTDLG_ChangePrinterA(), PRINTDLG_WMInitDialog(), START_TEST(), test_DeviceCapabilities(), and test_DEVMODEA(). Definition at line 1563 of file wingdi.h. Definition at line 1577 of file wingdi.h. Definition at line 1580 of file wingdi.h. Referenced by CreateDisplayModeList(), GetAdapterMode(), GetRefreshRateDescription(), Main_DirectDraw_EnumDisplayModes(), Main_DirectDraw_EnumDisplayModes4(), Main_DirectDraw_SetDisplayMode2(), and test_ChangeDisplaySettingsEx(). Definition at line 1562 of file wingdi.h. Definition at line 1547 of file wingdi.h. Referenced by ChangeDisplaySettingsA(), ChangeDisplaySettingsW(), EnumDisplaySettingsA(), EnumDisplaySettingsExA(), EnumDisplaySettingsExW(), EnumDisplaySettingsW(), GdiConvertToDevmodeW(), GetSystemColorDepth(), HelDdSetMode(), IsValidDevmodeA(), NtUserEnumDisplaySettings(), pagesetup_set_devmode(), PrintDlgA(), START_TEST(), test_ChangeDisplaySettingsEx(), test_DeviceCapabilities(), test_DEVMODEA(), and update_devmode_handleA(). Definition at line 1545 of file wingdi.h. Definition at line 1567 of file wingdi.h. Definition at line 1548 of file wingdi.h. Referenced by EnumDisplaySettingsExA(), EnumDisplaySettingsExW(), IsValidDevmodeA(), Main_DirectDraw_SetDisplayMode2(), Notify(), post_640(), post_640_no(), post_8bit(), post_8bit_no(), PRINTDLG_ChangePrinterA(), PRINTDLG_UpdatePrintDlgA(), START_TEST(), test_ChangeDisplaySettingsEx(), test_CreateCompatibleDC(), test_DeviceCapabilities(), test_DEVMODEA(), test_GdiConvertToDevmodeW(), and test_OpenPrinter_defaults(). Definition at line 1571 of file wingdi.h. Referenced by convert_to_devmodeA(), GdiConvertToDevmodeW(), IsValidDevmodeA(), PRINTDLG_WMCommandA(), and START_TEST(). Definition at line 1572 of file wingdi.h. Referenced by convert_to_devmodeA(), and GdiConvertToDevmodeW(). Definition at line 1578 of file wingdi.h. Definition at line 1551 of file wingdi.h. Referenced by pagesetup_get_orientation(), pagesetup_set_orientation(), PRINTDLG_ChangePrinterA(), and PRINTDLG_WMCommandA(). Definition at line 1553 of file wingdi.h. Definition at line 1552 of file wingdi.h. Referenced by pagesetup_get_papersize(), pagesetup_set_papersize(), PRINTDLG_SetUpPaperComboBoxA(), PRINTDLG_WMCommandA(), and test_OpenPrinter_defaults(). Definition at line 1554 of file wingdi.h. Definition at line 1575 of file wingdi.h. Referenced by CreateDisplayModeList(), GetAdapterMode(), InitListAllModesDialog(), Main_DirectDraw_EnumDisplayModes(), Main_DirectDraw_EnumDisplayModes4(), Main_DirectDraw_SetDisplayMode2(), mEnumDisplaySettingsA(), post_640(), post_640_no(), and test_ChangeDisplaySettingsEx(). Definition at line 1574 of file wingdi.h. Definition at line 1561 of file wingdi.h. Definition at line 1558 of file wingdi.h. Definition at line 1555 of file wingdi.h. Definition at line 1546 of file wingdi.h. Referenced by convert_to_devmodeA(), EnumDisplaySettingsA(), EnumDisplaySettingsExA(), EnumDisplaySettingsExW(), EnumDisplaySettingsW(), GdiConvertToDevmodeW(), GetAdapterMode(), GetSystemColorDepth(), HelDdSetMode(), IsValidDevmodeA(), Main_DirectDraw_EnumDisplayModes(), Main_DirectDraw_EnumDisplayModes4(), Main_DirectDraw_SetDisplayMode2(), Notify(), NtUserChangeDisplaySettings(), NtUserEnumDisplaySettings(), pagesetup_set_devmode(), PrintDlgA(), START_TEST(), test_ChangeDisplaySettingsEx(), test_DeviceCapabilities(), test_DEVMODEA(), test_GdiConvertToDevmodeW(), test_OpenPrinter_defaults(), test_WM_DISPLAYCHANGE(), and update_devmode_handleA(). Definition at line 1544 of file wingdi.h. 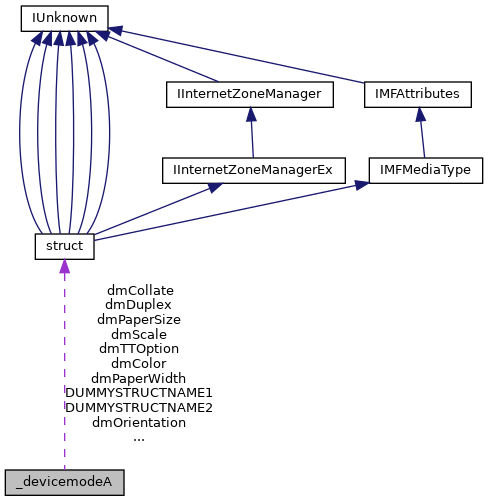 Referenced by convert_to_devmodeA(), GdiConvertToDevmodeW(), and test_DEVMODEA(). Definition at line 1569 of file wingdi.h. Definition at line 1568 of file wingdi.h.